Fast, fresh and easy! Crisp, sweet Honeycrisp apple combines with punchy pineapple, a hint of heat, and crunchy pecans in a delightful and versatile salsa with an island twist. 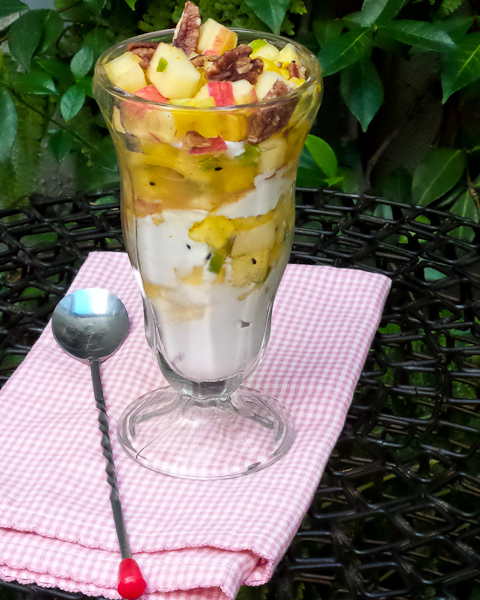 Amazingly versatile, this fruity salsa dresses up your breakfast yogurt parfait, is the perfect healthy pairing for chips at tailgate parties, puts spark into pork tacos for Taco Tuesday, and its delicious acidity pairs well with broiled wild salmon. Breakfast, lunch or dinner – we’ve got you covered! Honeycrisp apples have been all the rage for the last couple of years. 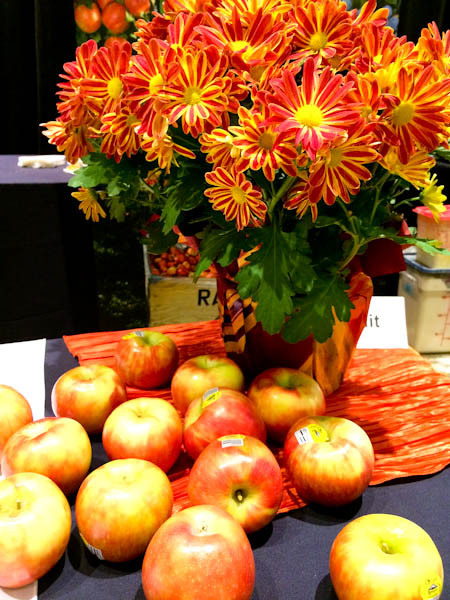 Me – I started seeing evidence of a marketing campaign last year, but never really sought them out – until one bite of the “forbidden” fruit at IFBC in Seattle where Rainier Fruit Company was offering tasty samples. As cliche as it sounds – it was love at first bite! In almost 400 years of cultivating apples on these shores, Honeycrisp may be the first true name-brand domestic variety to hit the shelves demanding a price out of this segment of the market – a designer apple, if you will. Description: Honeycrisp apples have a yellow-gold background generously brushed with vibrant red. Characteristic shallow dimples and numerous small lenticels cover its surface. Lenticels are the pores of the apples that allow the exceptionally juicy and crisp texture. Maturity affects this apples good taste. Generally super sweet, the flavor can vary from mild to fairly robust, depending on its stage of growth. Parentage: This apple was developed from a 1960 cross of Macoun and honeygold apples at the University of Minnesota. Availability: Supplies are limited, but growing. Harvested in late September. Usage: Honeycrisp makes delicious pie, sauce, cobblers, kuchen, muffins, cakes, cookies, quick breads and tarts. This apple freezes nicely and may be dried. 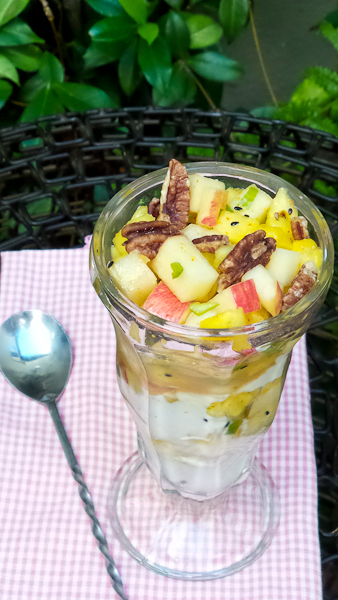 This apple is also a great addition to fresh fruit salads. A total party in your mouth – you’ll be ecstatic at how easy, perky on the palate, and versatile this Pineapple Honeycrisp Salsa is! I’d love to hear how you decide to use it. Crisp, sweet Honeycrisp apple combines with punchy pineapple, a hint of heat, and crunchy pecans in a delightful and versatile salsa with an island twist. 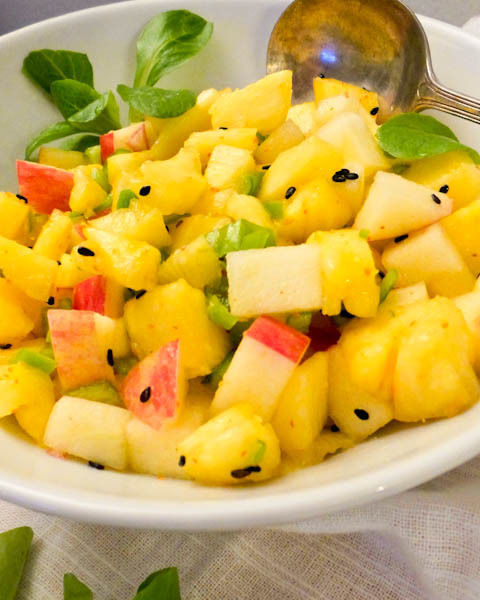 Combine the pineapple, apples, and peppers in a large bowl. Whisk together the olive oil, vinegar and Togarashi seasoning. Add dressing and sesame seeds to the fruit mixture, stir to combine. Devour as a fresh fruit salsa or salad, as a flavorful accompaniment for fish or chicken, or layer with Greek yogurt in a parfait. *Togarashi is a Japanese spice of chili pepper, orange peel, sesame seeds, Japanese pepper, ginger and seaweed. I like the addition of shichimi togarashi! 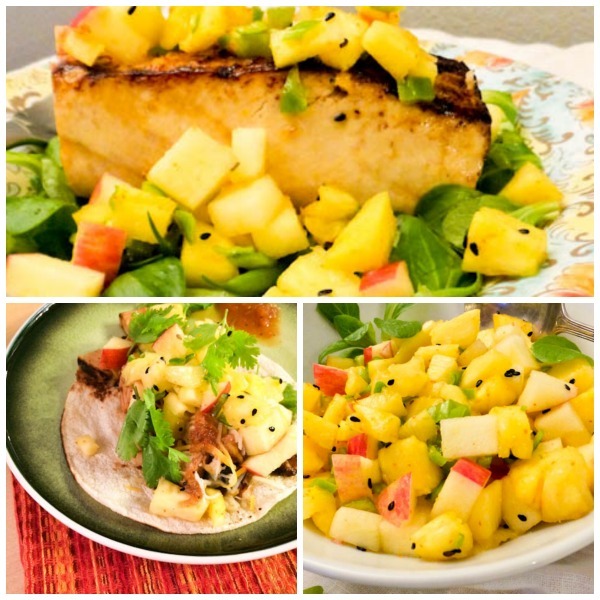 Pineapple and apples – that’s a nice combination for salsa! We love fruits and salsa, so this will be fun to make this fall!